3 boys and 2 girls still available. Our beautiful Sky.Maidie Sheena Girl. has given birth to 11 healthy puppies .We have 3 girls and 8 boys varying in colour from cream to dark gold. Sky is our loving family pet .very active .intelligent .friendly .fun and always eager to please.She is K.C registered and can be seen with puppies. Dad is Angus .Soinneanta Capercaillie of Fallowfen..Angus is soft outgoing Golden Retriever with good working ability.he has fantastic temperament and honest ways.He is fully health tested.hips 3.4.elbows 0.0.clear eye certificate.DNA tested clear..More about Angus you can find on Fallowfen Gundog web. 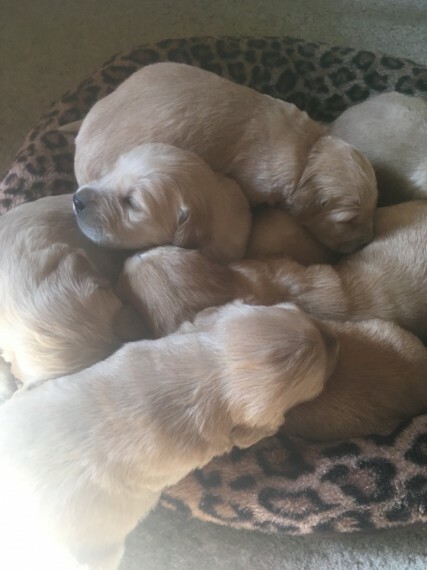 Average Inbreeding Coefficient for Golden Retrievers is 8.8..puppies from this litter have a coefficient value of just 0.4..This means they are less likely to develop health problems. Our puppies are very well socialised .brought up with children .other dogs and cat. All puppies will be KC registered .with 5 generation pedigree and 5 weeks insurance. They will be wormed at 3.5 and 7 weeks with Panacur. They will be michrochipped and vet checked . They will come with puppy pack.food .blanket and toy.. If you would like to meet our puppies you can text or call any time. Puppies will be ready for new loving homes 15.6.2018. Deposit .n.r..of 200 will secure pup of your choice . Viewings are welcome from this weekend .12.5. Thank you.